I'm still working on TOTT Bot, the robot that takes out the trash. I've built a chassis with Actobotics parts, but want to rework it before I post more. The more I think about it, the less I like the idea of grabbing and tilting or even lifting the trash can. I'd kind of like to explore turning my trash cans into trailers that the robot can hook up to and drag to the curb. I'm also working with the creator of OpenMV to bring them to market as it were. We'd both love to see a really low cost machine vision module in the hands of hobbyists. One that is capable of 25fps face detection, real time color blob detection, USB support and more. Look for more updates over the next several weeks. I've developed a compact RoverPower module that combines a 5V supply with battery voltage and current monitoring that will replace my AttoPilot and Pololu 3.5A step down switching power supply. Don't get me wrong, I love the Pololu supply. I have three. I recommend them all the time. But for my Rover I wanted to consolidate. So why is RoverPower a better configuration? 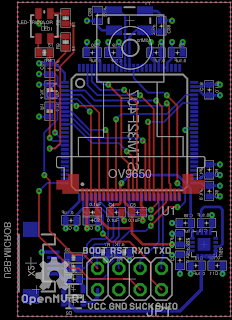 Small at about 0.96" x 1.2"
A revision to RoverMux is in the works. The new version is simpler, just plug in and go. The BEC jumper (see above) is history. Revision 0.4 also fixes a missing AVRISP trace. I'm excited to review the AVR Dragon debugger/programmer soon. I've been borrowing an exorbitantly priced JTAG ICE MkII for a few years. The Dragon is much cheaper but it looks like it can do a lot: HV programming, debugging, flashing in-system or out, and more. Can't wait to use it. I'm also really eager to start working with the Freescale Freedom KL46Z. It's mbed compatible and has some neat peripherals: a microscopic 4-digit LCD display, accelerometer, magnetometer, capacitive touch slider, Arduino form factor headers, 48MHz Cortex M0+, 32K RAM, 256K Flash, lots of SPI, I2C, I2S, UART, PWM, ADC, and DAC peripherals. I've become intrigued by Freescale ARM processors of late; they seem to pack a whollop with great price-for-performance ratios, really fast ADCs and more. And the Freedom boards seem a bit more usable than the daunting double-row-of-pins you get with a Discovery board. I'm also working on a large display day/time clock for my mom. I've run into some snags with the enclosure but as soon as I get that wrapped I'll post up the build. For the TOTT Bot, have you considered making a robot out of a wagon, and simply putting the trash cans on the wagon? That might be even simpler than making trailers out of the trash can. That would be simpler. Interesting idea! I'll give that some more thought. Thanks! Awesome projects! I'm looking forward to hearing more. On the RoverPower module, a 3.3V option would be nice -- there is more and more 3.3V stuff these days (like every GPS out there). You have a point. 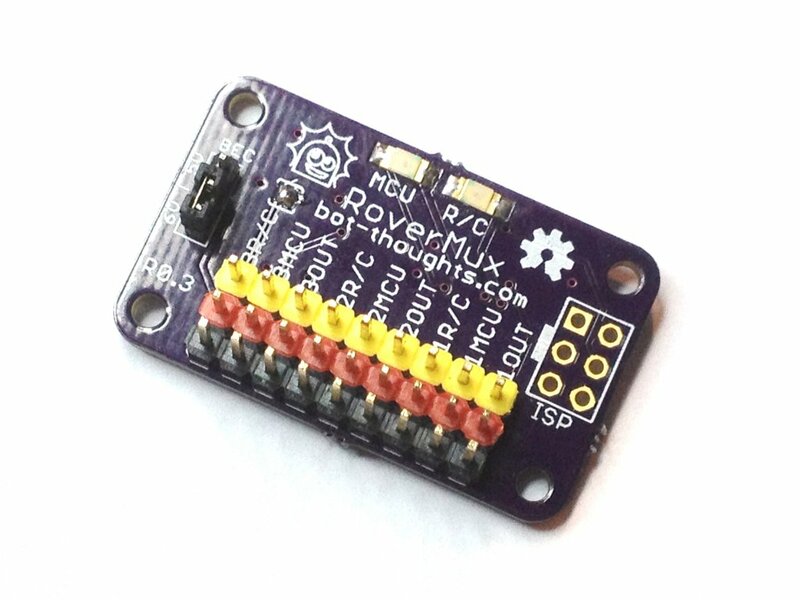 I was thinking about my own use case: run 5V to the RoverBaseboard which has onboard 3.3V regulator. That way the baseboard can supply 5V to the odd GPS or LCD screen and 3.3V to everything else. I'll look into it some more. It may be hard finding a 1.5A regulator that comes in both 5V and 3.3V. I suppose I could just use an LM317 with different resistors, couldn't I? My son and I are avidly reading your posts. We are going to attend the local dallas robotics club. I'll have to tell them about your work and see what they think!